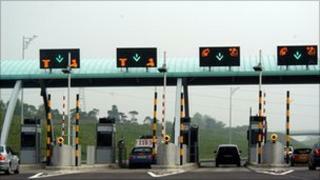 The cost of using the M6 Toll road is to rise from March. Owners, Midland Expressway Ltd, said it will cost £5.30 for cars to use the route, a rise of 30p, and HGV drivers will see a 60p increase to £10.60. Last year, the Birmingham Chamber Group said many firms told them they did not use the motorway because of the cost. But Midlands Expressway blamed the 3.5% increase on the recent 2.5% VAT rise and insisted it was in line with inflation. The toll road covers 27 miles from Junction 11a on the M6 near Cannock, Staffordshire, rejoining the M6 at Junction 3a at Coleshill, Warwickshire. Its owners said it is used by up to 55,000 cars every day. Tom Fanning, from Midland Expressway, said: "The M6 Toll continues to provide the strategic route through the Midlands, offering an excellent driver experience and the reliability that our customers require and demand. "Following the recent 2.5% VAT increase, we are making a necessary adjustment to our toll rates. "The toll increase of 3.5% is in line with inflation. "The M6 Toll continues to offer real value for money for the certainty and reliability which we deliver." The new prices come into force on 1 March.